What Are Voodoo Dolls and Are They Real? The idea of Voodoo dolls sparks fear and conjures up images of violent and bloodthirsty revenge in popular films, books, and oral histories in North America. These stories report that Voodoo dolls are made by Caribbean cult members who bear a grudge against an enemy. The maker thrusts pins into the doll, and the target is cursed with misfortune, pain, and even death. Is there really anything to them? Are Voodoo dolls real? The Voodoo dolls that are sold in shops in New Orleans and elsewhere are small human effigies, made from two sticks tied in a cross shape to make a body with two arms sticking out. The shape is often covered in a brightly colored triangle of cloth and sometimes Spanish moss is used to fill out the body form. The head is of black cloth or wood, and it often has rudimentary facial features: eyes, nose, and a mouth. They are often decorated with feathers and sequins, and they come with a pin or a dagger, and instructions on how to use it. These Voodoo dolls are strictly made for the tourist market in places like New Orleans or the Caribbean, where they are sold as inexpensive mementos in tourist shops, in open-air markets, and thrown during parades. They are not used by actual Vodou practitioners. Human effigies such as the Voodoo dolls—both the authentic ones and the ones sold in shops—are examples of figurines, representations of humans that are characteristic of many different cultures, beginning with the Upper Paleolithic so-called "Venus figurines." Such images are of idealized heroes or deities, or perhaps very carefully modeled representations of a recognizable historical or legendary figure. There are many ideas about their purposes, none of which include revenge. Just as one burns a wax figure in fire, dissolves a clay one in water, so may they burn your figure in fire, submerge it in water. The idea of evil Voodoo dolls as seen in Hollywood horror films may be much younger, from the 1950s when thousands of "cashew dolls" were imported to the United States from Haiti. These were made of cashew shells, and had eyes made of the jequirity bean, a form of castor bean which when swallowed by young children can cause serious injury or death. The U.S. government issued a Public Health Warning in 1958, which said that the dolls were "lethal." Items that Vodouisants use in rituals to communicate or invoke deities known as lwa or loa are called pwen. In Vodou, a pwen is an item filled with particular components that appeal to a particular lwa. They are meant to attract an lwa and gain its influences for a person or place. However, pwen come in a variety of forms, one of those happens to be dolls. Vodouisants say that a pwen doesn't even have to be a physical object. A pwen doll can be anything from a crude poppet to an elaborate work of art. On the surface, these dolls could be called Voodoo dolls. But as with all pwen, their purpose is not to enact harm but to invoke lwa for means of healing, guidance, or whatever need the Vodouisant has. Crocker, Elizabeth Thomas. "A Trinity of Beliefs and a Unity of the Sacred: Modern Vodou Practices in New Orleans." Louisiana State University, 2008. Print. Fandrich, Ina J. "Yorùbá Influences on Haitian Vodou and New Orleans Voodoo." Journal of Black Studies 37.5 (2007): 775-91. Print. Green, Anthony. "Neo-Assyrian Apotropaic Figures: Figurines, Rituals and Monumental Art, with Special Reference to the Figurines from the Excavations of the British School of Archaeology in Iraq at Nimrud." Iraq 45.1 (1983): 87-96. Print. Rich, Sara A. 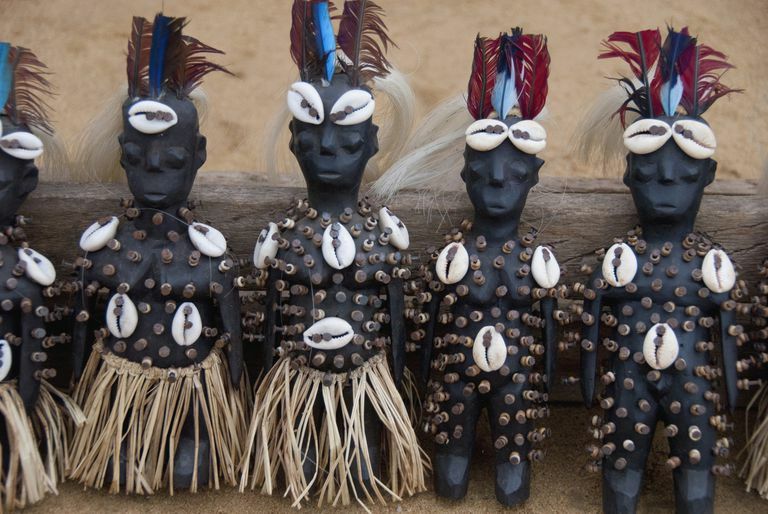 "The Face of "Lafwa": Vodou & Ancient Figurines Defy Human Destiny." Journal of Haitian Studies 15.1/2 (2009): 262-78. Print.